With just over three weeks to go until the September 21 People’s Climate March, we are receiving more and more questions from people about everything from logistical details to the message of the Nuclear-Free, Carbon-Free Contingent. In some cases, we just don’t have answers yet–especially on some of the logistical issues, some of which are pretty important. The People’s Climate March didn’t exactly have everything planned when the organizers announced the event. From our perspective, it seems more like the event was announced with the hope that it would take off, and the planning would depend on the response. Fortunately, the event has taken off and momentum clearly is building. About 200 buses to NYC are confirmed and more are being chartered from various areas of the country just about daily. There are special trains coming from the West Coast and from Washington DC. There are car caravans being set up. 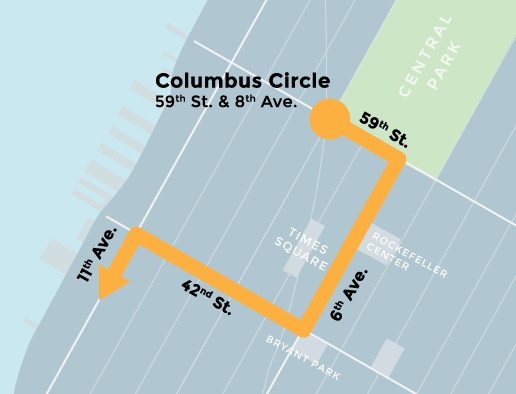 And, of course, with tens of millions of people living within commuting range of New York City, there is a huge local base to draw on who don’t need chartered buses or other special transportation. In short, this is going to be big, and any logistical decisions that might have been made two months ago would have be thrown out the window now anyway. What we do know: like the march time, the march route, the main assembly area, where to look for buses and other transportation–all that is posted on the Nuclear-Free, Carbon-Free Contingent website here. That site is now being updated daily and will continue to be through September 21. What we don’t yet know: like the location of the nuclear-free, carbon-free activist meeting on Saturday afternoon, September 20; the exact assembly point for the Nuclear-Free, Carbon-Free Contingent; whether the police will allow us to have sound at the assembly point so we can have a mini-rally for the Contingent; and some other details, will be posted on that site as soon as we confirm that information. Somewhat more ephemeral is what the March, and the Contingent, will look like, but we get a lot of questions about that too. And while no one will know for sure until we all get there, we at least have some ideas. The March itself will be spread out over many, many city blocks–that is a certainty. Like I said above–this is going to be big. Historic even. The Nuclear-Free, Carbon-Free Contingent most likely will be around the middle of the march, under the general heading of contingents fighting against various dirty energy sources. And the Contingent will be large. 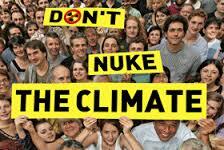 The Contingent will be led by a very large, bright blue “Carbon-Free, Nuclear-Free” banner. 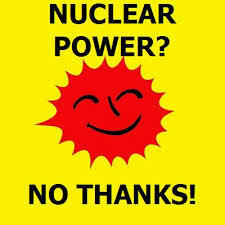 But probably the most striking visual aspect will be 650 bright yellow Smiling Sun flags that say “Nuclear Power? No Thanks,” which in one graphic gets across both our opposition to nuclear power and our support for renewable energy. 400 of the flags will be in English, 150 in Spanish, and 100 in Japanese. It’s a universal message. Besides the flags, which will be held high and very visible, NIRS also will be bringing 200 Don’t Nuke the Climate posters, also mounted to be held high and visibly. And we have a few other large banners we’ll be bringing. Between the flags, signs, and banners, the nuclear-free aspect of our message will really get across, colorfully and vibrantly. So if you’re coming without your own signs, don’t worry at all–there will be plenty available to carry. Many groups and people in the Contingent will be bringing their own signs, banners and other materials, of course. And that’s great. That will add to the visual kaleidoscope and bring special attention to a lot of regional and local concerns. For example, we expect a large group focused on shutting down New York’s Indian Point reactors–that group is also bringing along a giant King CONG (coal, oil, nuclear, gas) prop. Another group will be focused on the Pilgrim reactor. And others with other specific reactors and/or issues in mind. We might also see–and we’ll certainly welcome–people and signs/banners and the like against coal; against fracking and other dirty energy; for clean, renewable energy. Because that’s really what the Contingent is about: the nuclear-free, carbon-free solution to our climate crisis. There probably won’t be a lot of signs in the Contingent about climate change itself; there are plenty of other groups who will have those. This Contingent ultimately is about the clean energy solutions–which is what unifies all of us who fight different dirty energy sources. And, over the next three weeks, we’ll be producing more materials that will be useful in articulating that message and the solutions–and hopefully will make for good reading on the buses to New York as well. We’ll be posting them on the Contingent website too. We also hope, and expect, the Contingent will reverberate with sound. People have talked about bringing drums and acoustic instruments, and we encourage that; we’ll have songs and chants ready to go. No one wants to walk through the city in silence–this will be more of a celebration. Yes, the climate is in a state of crisis and that’s deadly serious. And yes, nuclear power is trying to rescue its failed technology on the back of that crisis, and that’s deadly serious too. But we have the solutions–and that is definitely worth celebrating not only for ourselves but for everyone. Because remember: this event is growing to historic proportions. The largest climate march ever. The largest anti-nuclear statement in decades. The whole world will be watching. You’ll want to be there. GreenWorld is going on vacation! Yes, even activists get a break now and then (fortunately). We will return on Monday, September 15. What a disturbing photo. Obviously the pro nuke forces have organized to trash this event. What on earth are you talking about? 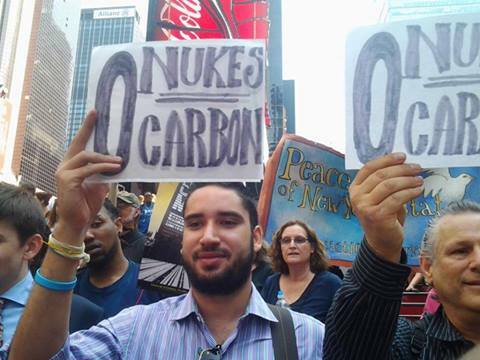 The top photo is of the press conference announcing the march, with two nuclear-free, carbon-free activists holding 0 Nukes, 0 Carbon signs; the bottom photo is of a Don’t Nuke the Climate protest…. Heck–I misread the zero signs in top photo. Peter……….right! Gradually our voices will be heard as the pollution proliferates in Japan (and elsewhere-I hope not). 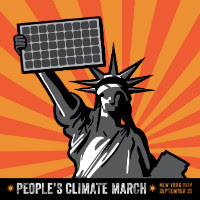 Hi Jo, What with Indian Point so close by…there may be a few who want to not let the march be “nukeless. ” Ha… let ’em march… they will be out numbered so many times over.